LIGHT behaves differently in air and water. This is why a stick, standing in water, looks bent. This phenomenon makes it all the more difficult to catch a fish swimming underwater, but Kingfishers overcome this problem and do not face any trouble. The reason is that they have two foveas (depression or pit) which enable the bird to adjust its eyes accordingly, both above and below water. As the bird enters from thinner medium (air) to a denser medium (water) visual distortion is overcome by the second aquatic fovea, which compensates for the change in conditions and ensures that the bird catches its prey successfully. There are 84 species of Kingfisher which are found worldwide. These brightly coloured birds with large heads, short necks and compact bodies, feed on fish, insects and small vertebrates. They are usually found in riverine and terrestrial habitats. 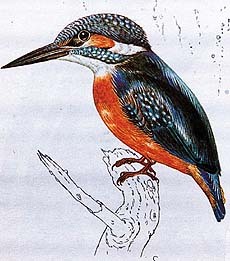 The generic name of many Kingfishers, halcyone, is derived from the name halcyone, which is a bird in Greek mythology. According to the story, halcyone, a female character, and her husband, whom she found drowned on the shore, were turned into birds by the gods. The birds were called Halcyones. Mythology says that these birds built their floating nests on the sea seven days before the shortest day of the year and brooded on the eggs for the next seven days. The gods saw to it that these 14 days were calm and windless, hence the expression halcyone days for periods of calm, peace and tranquillity. All the Kingfishers nest in holes. It can be a hollow of a tree, burrow in the mud-bank of a river or in termite mounds. It is remarkable to note that about 25 per cent of the species use termite mounds for nesting. Both members of a mating pair go through a trial-and-error search for a suitable termite mound, and when one is found, the business of drilling a tunnel into it begins. The outer coating of termite mounds are generally hard, and to make the initial penetration is far beyond the pecking-strength of the birds. So these birds adopt a strategy of attacking the mound, at a particular spot, one after the other. Their flying attacks make a series of tiny punctures in the mound. Once a small hole is made through the outer crust the birds take turns at clinging to the edge of the hole and enlarging it. As the hole is driven deeper the small tunnels inside the mound are exposed and are immediately sealed by the insects inside, in order to maintain the required conditions of darkness and humidity inside the anthill. This sealing off also prevents any contact or clash between the insects and the bird; the passage and nesting chamber are kept open by the coming and going of the birds. The nest may take anything up to a fortnight to complete. When the nesting is finished and the cavity is abandoned, the termites may seal the outer opening again. If they do not seal the nest properly, it may be reopened and used again in following seasons by the same pair of birds. The Pied Kingfisher is a very efficient and unique hunter. Unlike other species, who sit on the banks of rivers or ponds and wait for the prey to come to the surface before taking a plunge, it flies over the water body and scans for small fish or tadpoles that may venture near the surface. As the prey is sighted, the bird stops in mid-air and while hovering, it adjusts its position and drops like a stone from a height of nine metres submerging completely, and within seconds it is again out of water with the prey in its bill.